Why host a paintball party for your next big event? 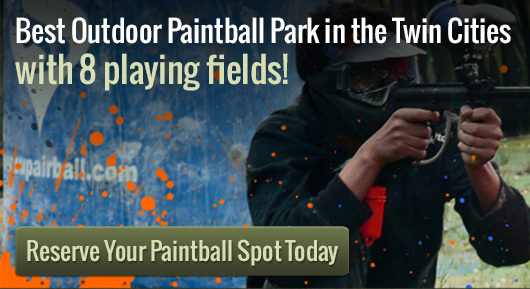 Action Packed Paintball is Minnesota’s paintball party headquarters. The days of a home birthday are long gone. In this day and age it has becomes harder and harder to find a creative and unique party idea. For those people looking to impress their family, friends or co-workers a paintball party might be a great idea. Most people have heard of paintball but few have had the chance to try it. A paintball party is a perfect idea. Paintball makes for an excellent birthday party. A paintball party let’s kids (and adults) have fun, get exercise and enjoy the outdoors. The best part is that paintball is for everyone. Players of nearly any age can join in the fun (there is a minimum age requirement). Let Action Packed Paintball make it a great day and take care of all of the details. All of the equipment and paint can be rented or bought at Action Packed Paintball. Another great party idea is a team building or office party. Instead of a stuffy meeting or boring presentation, impress your office with a day of paintball. What better way to get co-workers working together than a strategic game of paintball. Maybe you are planning an upcoming bachelor party or other group party. Everyone will have fun spending the day playing paintball. It is truly for young and old alike. So, for those people looking for a new and unique party idea this just might be the one. With excellent prices and packages it is a fun and easy party. With private playing fields and all day access to the park it is a winning party idea.